Miami Trace senior Austin Mathews takes the ball to the basket during a Frontier Athletic Conference game at Hillsboro High School Friday, Jan. 25, 2019. Pictured for the Indians are Luke Magulac (10) and Reece Bloomfield (42). HILLSBORO — The Hillsboro Indians won their third consecutive game on Friday night when they hosted Frontier Athletic Conference rivals the Miami Trace Panthers in a close 42-38 home win. The Indians trailed 22-19 at halftime but outscored the Panthers 23-16 in the second half to pick up the hard-fought victory. The highlight of the night came in the fourth quarter when Hillsboro senior Reece Bloomfield used a terrific ball fake and drove to the basket for a layup to put the Indians up 37-31 as the partisan Hillsboro crowd erupted. 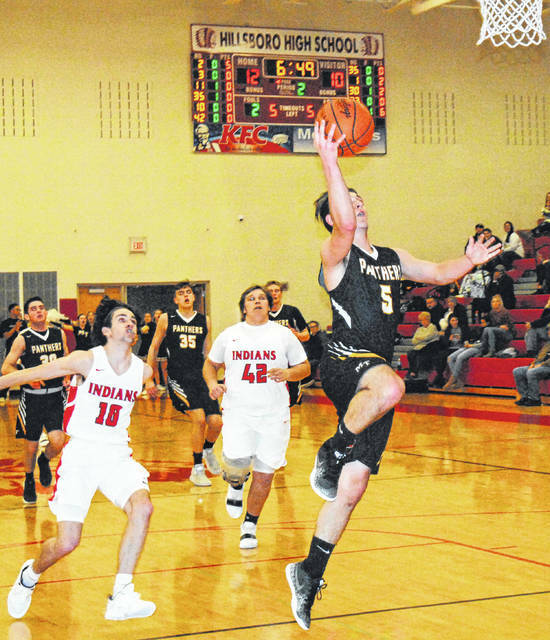 Miami Trace answered with an offensive rebound and put back by Austin Brown before Ethan Steele hit his second three-pointer of the game to get the Panthers within two points at 38-36. After a defensive stop by the Indians, Scott hit a mid range jumper from the left corner to make it 42-36 with 38.5 second to play. A technical foul on Hillsboro gave Austin Mathews a chance to tie the game but he missed both and then Brown missed consecutive free throws with 56.6 seconds to play in the third before Gavin Temple hit a three pointer for the Indians that gave them a 33-28 lead and set up the wild fourth quarter finish. Hillsboro will be back in action on Tuesday, January 29, when they host the Goshen Warriors in a non-conference match-up. The Panthers (1-15 overall, 0-8 in the FAC) will play at Waverly Saturday and at Wilmington Tuesday. MIAMI TRACE — Ethan Steele 0 (3)-0-9; Austin Brown 4-0-8; Austin Mathews 1 (2)-0-8; Dylan Bernard 1 (1)-0-5; Cameron Moore 1-2-4; Kyler Conn 2-0-4; Logan Rodgers 0-0-0. TOTALS — 9 (6)-2-38. Free throw shooting: 2 of 6 for 33 percent. Three-point field goals: Steele, 3; Mathews, 2; Bernard. Field goal shooting: 15 of 39 for 38 percent. Three-point field goal shooting: 6 of 17 for 35 percent. Rebounds: 21 (4 offensive). Assists: 8. Steals: 4. Blocks: 5. Turnovers: 11. Personal fouls: 9. Bench points: 14. Second chance points: 6. Points off turnovers: 2. HILLSBORO — Mason Swayne 4 (2)-0-14; Ethan Watson 4-1-9; Reece Bloomfield 2 (1)-1-8; Ryan Scott 2-0-4; Gavin Temple 0 (1)-0-3; Brad Miller 1-0-2; Luke Magulac 1-0-2. TOTALS — 14 (4)-2-42. Free throw shooting: 2 of 5 for 40 percent. Three-point field goals: Swayne, 2; Bloomfield, Temple. Field goal shooting: 18 of 42 for 42 percent. Three-point field goal shooting: 4 of 11 for 36 percent. Rebounds: 19 (3 offensive). Assists: 7. Steals: 3. Blocks: 0. Turnovers: 7. Personal fouls: 9. Bench points: 10. Second chance points: 5. Points off turnovers: 4.